We’d just finished gushing over the GTI, having labeled it the perfect all round hatchback when VW Middle East decided to test our resolve by sending us the Golf R. Possibly wary of the infighting the GTI / Scirocco R pairing had caused at CarbonOctane, the invitation to test the R was extended only to one of us. Lucky me! The Golf R is of course the GTI with bulging muscles after an extended membership at the gym. Equipped with the same 2.0 liter 4 pot engine as the GTI and with a potent Borg-Warner turbo charger, it replaces the Golf R32 in VW’s lineup. For those who were alarmed at the prospect of VW downsizing from a 3.2Litre 6 cylinder engine, the Golf R reads out a convincing lesson on vehicle development in keeping with the demand of the times. This is after all the most powerful Golf that VW has ever made. That should silence the R32 fans even if they remain unmoved by the parsimonious fuel consumption of just 8.7 litres per 100 kilometres. A beefy 350 Nm of torque and an increase of 45 HP over the GTI bears testimony to the R’s hard edge. The torque spread starts out higher too, providing full pep from 2,500 to 5,000 rpm. The claimed acceleration of 5.7 seconds for the 0-100 sprint confirms that the muscles are put to good use. If the Golf GTI is a sporty hatch back, then the Golf R just tips over further onto the sporty scale to become a sports car in disguise, complete with 4 doors as in our tester, to cement the deception. The sports gene was evident when we pitted the R against the Nissan 370Z, also on loan to us during the week. Despite losing out a good 73 HP to the Z, the Golf R was able to keep the Z honest through some fast and twisty bends. The R’s 4MOTION all-wheel drive was helping offset any deficiency from its driver when the curves got really tight. However, the R does not give sure-footed spine twisting grip at all times and a leaden foot was soon rewarded with squealing tyres. The grip is relinquished grudgingly and with a high level of predictability, so there were no white knuckled moments behind the wheel. For the budding hooligan, there is a huge safety net waiting to scoop him up if he does lose the plot eventually. But let’s stop now before you feel that this car is a complete driver’s delight. It is great fun, yes but the experienced driver is soon going to be frustrated by the electronics. 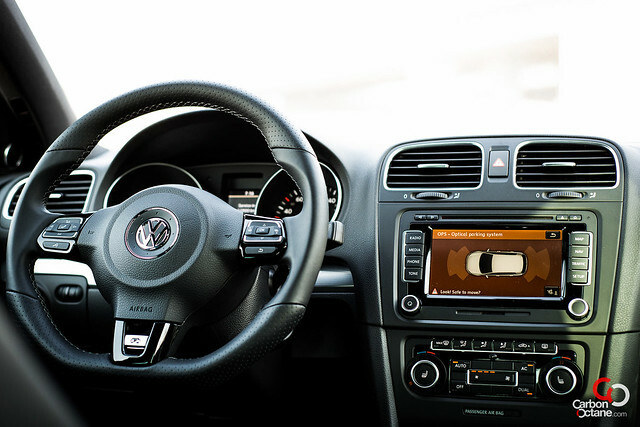 Drive to the wheel is modulated to such a level that there are times when you floor the speed pedal and you feel the car is leafing through the traction control program at a leisurely pace before deciding how much juice to dole out. In effect, this is the R being cleverer than the driver to intervene when an off road excursion is imminent. The way it goes about it may not be frustrating at road speeds, but on the track it would surely impede a veteran driver out to push personal limits. Centrally mounted dual exhausts immediately differentiate the R from the GTI even from a distance where you would not have spotted the ‘R’ badging. A more aggressive design to the front bumper makes it stand out when viewed from the front. Our test car came with Talladega black 19 inch wheels which seemed to send the rest of the CarbonOctane team into raptures. I must admit not being a big fan but would have shared the enthusiasm if VW had opted to paint the brake calipers in red or yellow to provide some visual relief. I was also slightly let down by the absence of the Parallel Park Assist feature which we had on the GTI. Surely for a car equipped to be a daily runner, this feature could have been retained on the Golf R. Otherwise, all the practicality of the GTI is carried over to the R. You get the same familiar VW layout, the reasonably spacious seating and in our case, also the high quality leather interior. We can’t stop raving about the 6 speed DSG gearbox which really puts up the strongest case we’ve seen against the purity of a manual transmission. There is no denying the pleasure to be had from rifle-bolt precision during gear changes, which just adds feel to the lovely power delivery when you are hooning around for kicks. Both the GTI and the R come with powerful air conditioning units which could tackle the worst of our summers. Not a mean feat when you are regularly looking up 49 Deg on the temperature readout. But the glaring sun brought a flaw which possibly wouldn’t be noticed in other markets. The window switches which are rubber covered have a stylish metallic edge which however tends to heat up when the car is left in the sun, making it a challenge to operate at times. An irritating flaw of course, but one that turned into a constant reminder to seek shaded parking at all times! So there you have it – the Golf R. For those who want more of everything that the GTI offers and in a more aggressive package, but with a heftier price tag. 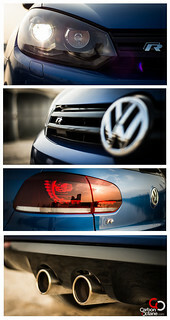 If you are a VW fan with eyes set on the GTI, the Golf R has just made the decision a little more confusing for you!